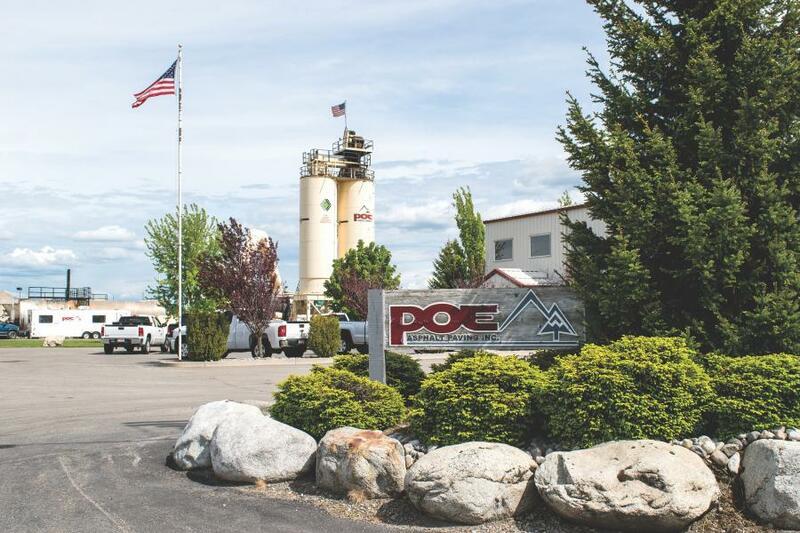 Poe Asphalt Paving has offices in Lewiston and Post Falls, Idaho, as well as in Pullman, Wash. In addition to asphalt plants at those sites, the company has another permanent facility in Grangeville, Idaho, and runs a portable operation. Poe Asphalt Paving marks its 65th anniversary this year as the company's history dates back to 1953 when Ernie Poe and Kenny Knapp formed a firm known simply as Asphalt Paving in Clarkston, Wash. Today, Poe Asphalt Paving has multiple locations that cover a significant portion of the Pacific Northwest and is led by third- and fourth-generation members of the Poe family. Instead, in 1962, Ernie and Don bought Knapp's share of the business and officially named the company Poe Asphalt Paving Inc. Don took over the reins shortly thereafter and ran the business for nearly 30 years before handing them off to Mark in the mid-1990s. Today, the company has offices in Lewiston and Post Falls, Idaho, as well as in Pullman, Wash. In addition to asphalt plants at those sites, Poe Asphalt Paving has a facility in Grangeville, Idaho, and runs a portable operation. More big moves followed. Under Don's leadership, Poe Asphalt bought one of the first drum mix plants in the area in the late 1970s. When Mark took over, he added another plant, office and shop in Post Falls in 2000. That location reaches the Greater Spokane, Wash., and Coeur d'Alene, Idaho, markets as well. “The decision to move an additional plant up north has been positive. We've built a good core group of employees who are both experienced and dedicated,” Mark noted. Mark's sons, Brian and Dustin, represent the fourth generation in the business. Brian is a Division Manager and takes care of estimating, project management and other administrative duties. As a Superintendent, Dustin runs field operations. The company's workload is approximately 65 percent public works contracts, such as highways and streets for the states, counties and municipalities in northern Idaho and eastern Washington. The balance is split between private and commercial activities; including driveways, parking lots, subdivision roadways and more. 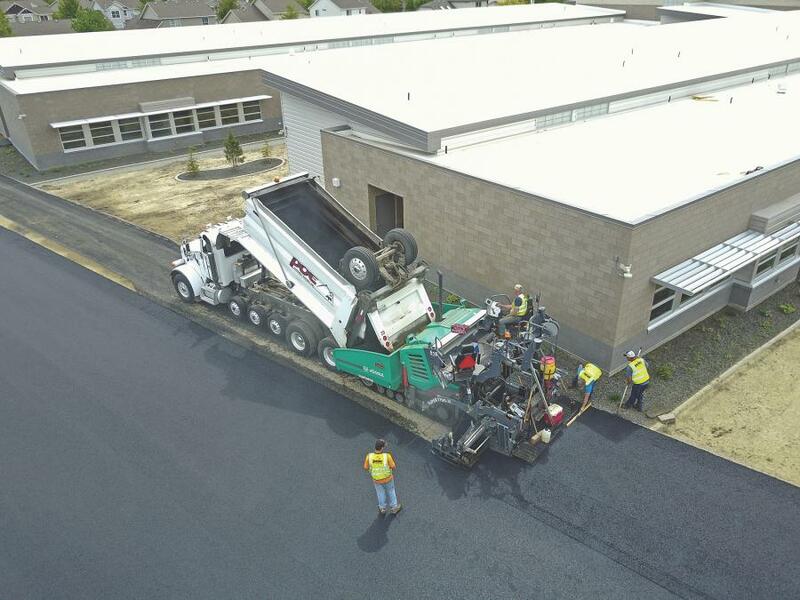 Poe Asphalt Paving typically runs one large job at a time. 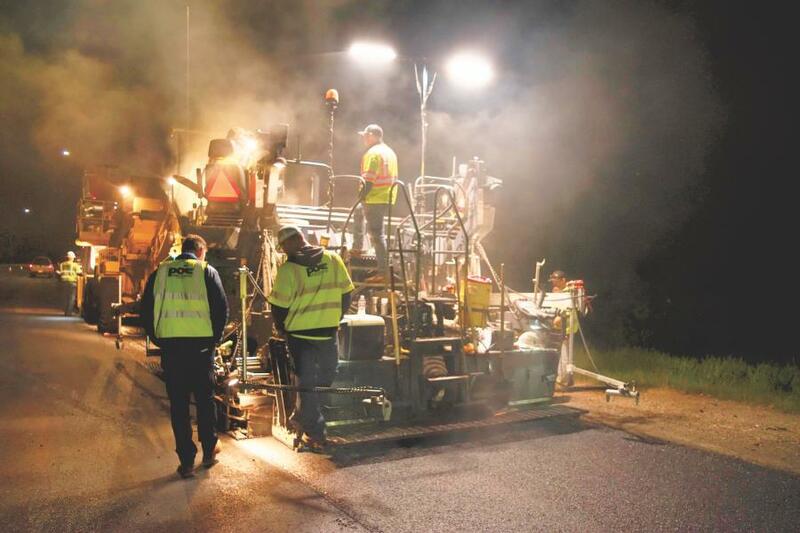 Recent projects include paving nearly 2.5 miles of asphalt on U.S. Highway 95 near Coeur D'Alene. Crews laid roughly 25,000 tons of material, 12 to 14 feet wide. Additionally, during a couple of weeks in late May of this year, Poe put down about 700 tons of material for a new parking lot, bus lane and playground at Liberty Creek School in Liberty Lake, Wash.
For larger assignments, such as Highway 95, Poe Asphalt utilizes a Highway Class, 10-foot Vögele Super 2000-3i that will pave up to 28 feet, 3 inches wide. Poe uses Carlson screeds that allow for attachments such as slope shoes, extensions and dual skis. A Vögele Super 1700-3i handles overlays, patches and other smaller jobs. The compact, Universal Class, 8-foot machine paves up to 19 feet 6 inches. 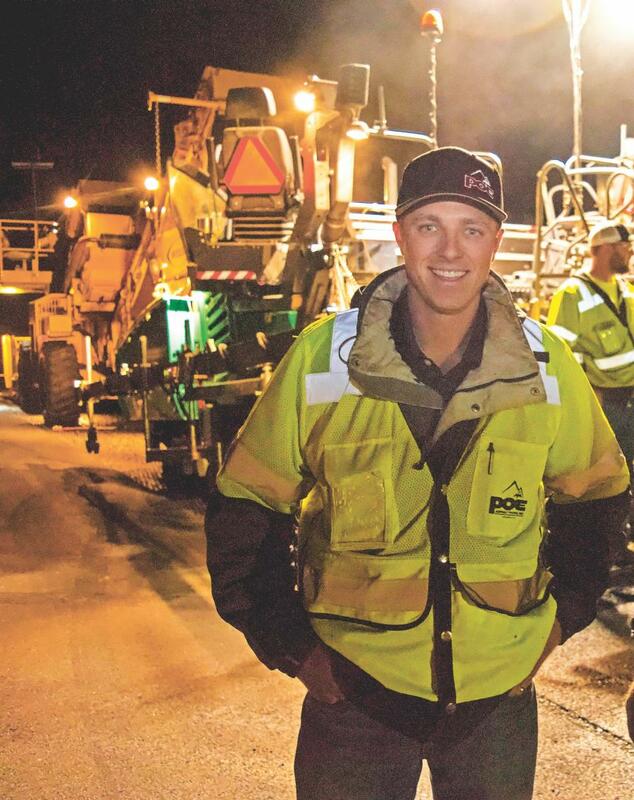 Modern Machinery Territory Manager Nathan Stott helped Poe Asphalt acquire both pavers. The Wirtgen Group sent an Applications Specialist to help train Poe Asphalt personnel on the machines. Modern Machinery provides further support with parts and service as needed for the pavers. The Poes know that the Vögele pavers will help them continue putting down solid asphalt mats that often lead to honors such as the High Quality Asphalt Pavement Construction Award it received from the Washington Department of Transportation for the U.S. 195 project it completed from Colfax to Dry Creek in 2013. 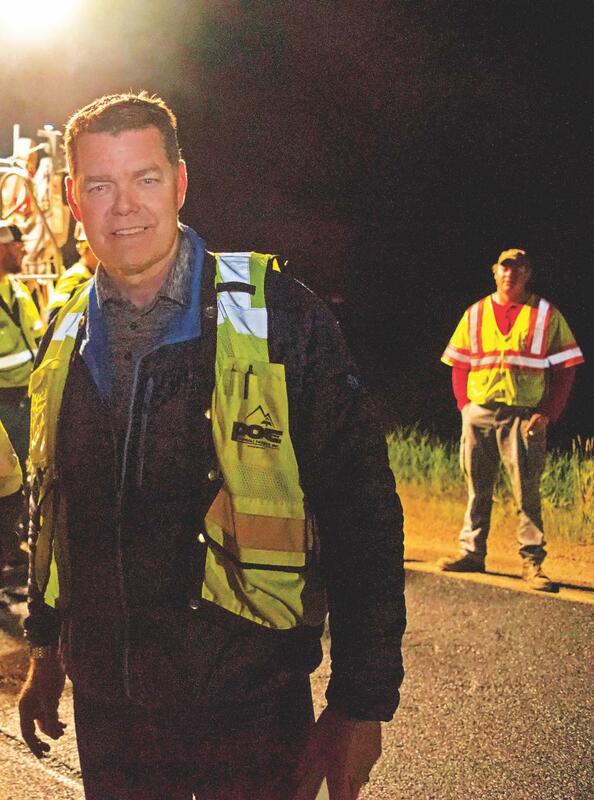 The Washington Asphalt Paving Association gave Poe Asphalt Paving its Smoothness Award for another job on U.S. 195, this one from the Idaho state line to Colton. That focus has led to many satisfied and repeat clients throughout the family's six decades in the asphalt business. “That's the goal of every project we build. 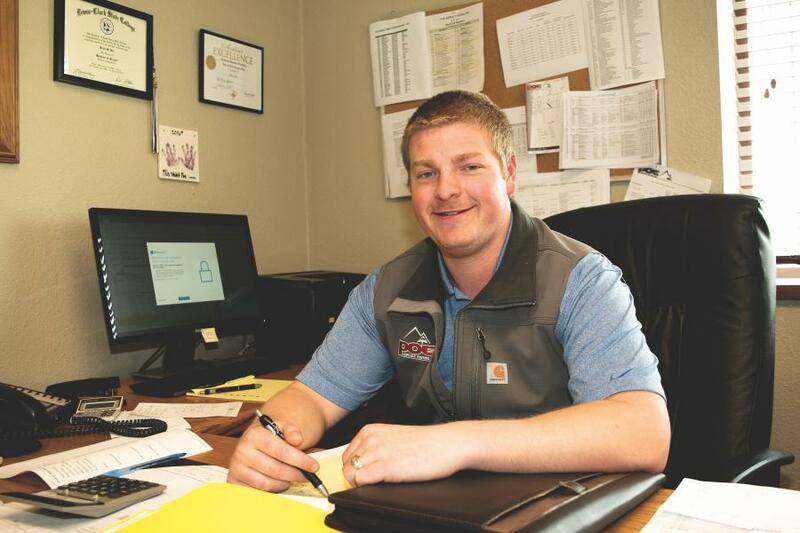 I think Grandpa would be extremely proud to know that we are in our fourth generation and continuing the quality work and values he started,” Mark explained.